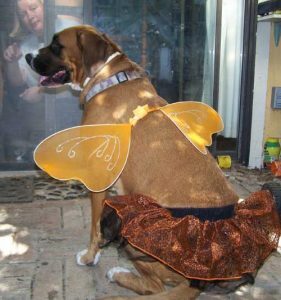 Since our household does not contain any small children, we normally make an effort to dress up the dogs in costumes instead. Cats are normally reluctant to cooperate in this kind of amusement, although I do wish that we could get some of the black cats to pose fetchingly with pumpkins, cauldrons, brooms and witch's pointy hats. This would so take care of decorating the front porch for tricker-treating. A couple of years ago we did borrow the grandson of our next-door neighbor when he wanted to dress up like the Prince of Persia and our neighbor confessed herself quite unequal to that particular challenge. We fitted him out in a tunic and sword-belt and turban, and I roughed out a sword and dagger from thin plywood, and he was so pleased with the whole effect that his grandmother had the greatest trouble in getting him to take it off and put on his pajamas to go to bed. This is not a problem we have noticed with the dogs. 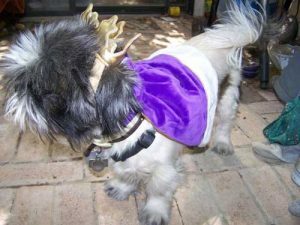 They don't seem to care one way or the other, although Spike the Shi Tzu – who craved attention from anyone at any time and for any reason – seemed to like a costume for the attention it gained. 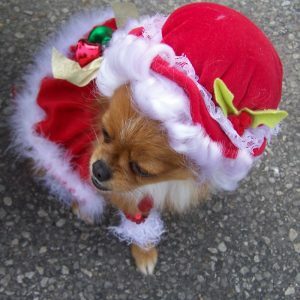 She had a whole collection of costumes, hats and accessories, mostly because there are a lot available and on sale at reasonable prices in small-dog sizes. Connor the Malti-poo has inherited the gender-neutral costumes from Spike, and wears them with panache. This year we will dress him up in a purple cloak and fabric-sculpture crown, I think. He's not particular – he likes everybody and everybody likes him, costume or not. The Lesser Weevil is a large and rawboned boxer mix, and her costume wardrobe is not as extensive. The bigger sizes in dog costumes are rarer and more expensive ... and compounding that is the fact that she is a dog who is as sensitive to being laughed at as your average thirteen year old girl. Given the wrong sort of costume, and the wrong public reaction to it, the Weevil would be hiding under the bed and crying her eyes out. My daughter sometimes amuses herself by dressing the Weevil in a ballet tutu skirt and gauzy fairy wings, but I believe the Weevil has begun to figure out how comic this appears. I think that she probably prefers to just appear as a dog. We'll probably just dig out the enormous black spider costume for her again; better to be slightly scary than totally ridiculous. We have seen some very clever dog costumes in past Halloweens and at the Buda Wiener-dog races this spring, where many of those who brought their dogs had made an effort to dress them up – some even as hot-dogs, with fabric 'buns' strapped to their sides like long saddle-bags. 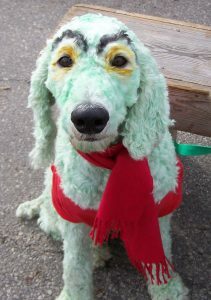 There were some very clever costumes on display at the yearly dog costume parade at the Christmas celebration at Goliad on the Square, including one white standard poodle who was colored green – to be the Grinch, of course, and a pair of Pekinese dogs dressed up as Santa and Mrs. Claus. So, that's our costume epic for this year – how is yours?